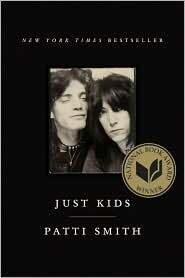 There is an atmosphere of misty, pink-colored romance that seeps from Patti Smith’s National Book Award-winning memoir Just Kids, that quickly envelops you when you read it. This mist transports you to another place and time where abject poverty is kind of charming, hunger is character-building, and the kindness of artistic strangers is a given. This mist is kind of like that one in the Stephen King novella aptly called The Mist, where once you’re in it you’re stuck. Unlike King’s mist, Smith’s is charming and endearing and not at all life-threatening. Smith’s memoir opens with the death of her soulmate and friend, photographer Robert Mapplethorpe. Upon getting the phone call, she tucks herself into a chair, listens to some aria, and begins to reminisce. She takes us back to the beginning her childhood where she led her siblings into imaginary battles, dropping out of college after an unplanned pregnancy (the child she gave up for adoption), working in a factory, and eventually chucking it all to move to New York City at the age of 20. There she spends a few weeks homeless and eventually ends up shacking up with Mapplethorpe, a poor art student from a strict Catholic family. They spend the next years intermittently as lovers, roommates, muses, and patrons. Throughout their relationship only two things remain constant: they act as each other’s biggest fan and they struggle to always make art. What that art is, they don’t always know. But they sure as hell try to make it. Along the way they interact with an ever-revolving cast of bohemians, most of them famous (or will be famous). Allen Ginsberg offers to buy the starving Patti a sandwich because he thinks she’s a beautiful boy, Jimi Hendrix talks about music outside a party, Janis Joplin entertains a crowd in her room at the Chelsea hotel, and Patti has a relationship with the married playwriting sensation Sam Shephard. At times the memoir feels a little name-droppy, but only because I had no idea about a lot of the names being dropped. Whenever she was talking about someone I recognized, I had no problem with the dropping. It’s a little tough to pinpoint exactly why this memoir works so well. Like I said it’s saturated with romance and that air of someone looking back on their youth. It’s washed over with nostalgia and the kind of “it wasn’t so bad” hindsight you must get after losing your best friend to AIDS and your husband a few years later to heart failure. It’s magic, I guess. Smith is charming even as she waffles through the 70s trying to decide if she’s a poet or an an actress or a visual artist and only by chance falls into the role of rockstar. Mapplethorpe is the really determined one and never hides his desire to be famous. He orbits around the Warhol posse, dragging Patti to Max’s Kansas City in hopes of getting some fame by association. The book speeds over the fame stuff, spending the meat of its time in those pre-fame years. And it ends just as it began with Robert’s death. I will warn you, gentle reader, it’s emotional and sad and will leave you a little distraught — even though you know it’s coming. Also, there is coda about the fate of Robert’s desk that will make you wonder how you could care so much about a piece of furniture. But you do. Like I said, it’s magic. Great review. Mist and magic is exactly right.